The road to the Massacre Trailhead has been eliminated. It has been plowed up, blocked and returned to the desert. 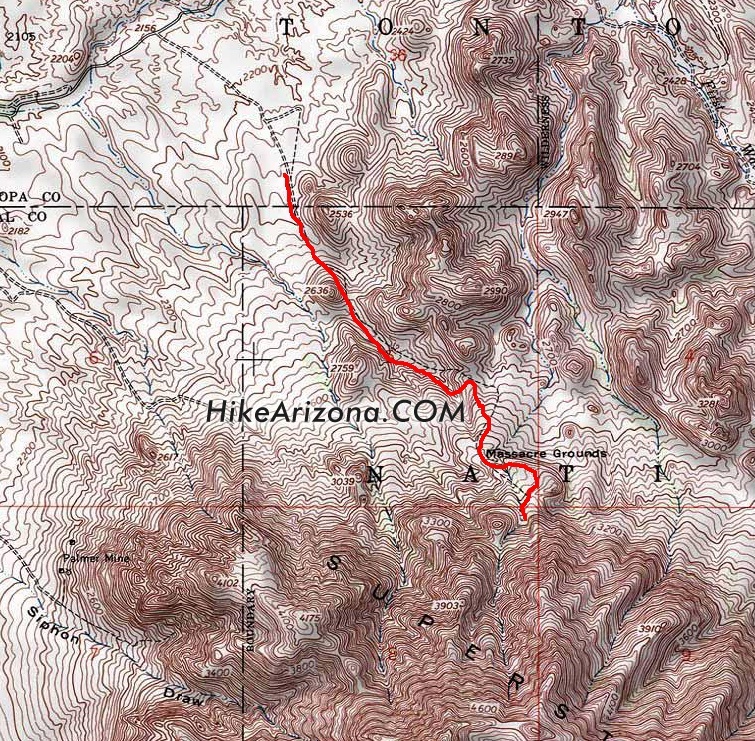 Page stats have been updated to start from the Crosscut Trailhead. View the Official Route for details. (from the old Massacre Trailhead) Walk through the fence from the parking area. The trail is wide and well defined. In season, wildflowers blanket the lower sections of this trail. Immediately to the left is small knoll with some small caves. The trail heads towards a mini needle then passes it on the east. The trail works up to a low saddle crossing a usually dry creek three times. Next comes the subtle ascent to the falls. When the creek is running you can hear the falls in the distant. Otherwise be on the look out for the dark vertical stripe to the southeast. The stripe is one of the falls. From the low-lying saddle mentioned above to the falls is nothing difficult, however it can be a route-finding challenge. My best advice is to study the map. Two or three cairned routes get you to the falls and one takes you far away to West Boulder Canyon. Generally the most traveled route gets you to the falls as it's the most popular destination in this area. My route of choice is the red line on the map. When you're hiking in you swear you are going wide to the east. Which it does "slightly" but not by much. 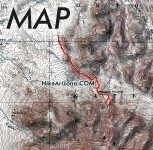 The old dashed line trail on the map is cairned too. Both routes work and you probably won't know the difference on your first outing. The trail goes through a tunnel of lush before delivering you to the east side of the Massacre Wall. Two falls pour over this wall. First encountered is the large waterfall on the east end. A short but steep canyon directly above the wall feeds this waterfall. It generally runs right after heavy rains. It pours off in a wide swath. This swath being the vertical stripe visible from distances far north into the wilderness. There is a nice spout on it's left which funnels water out from the wall. To the west is another waterfall. Although on the same wall it's fed by a different drainage. This drainage goes all the way up to the Superstition Ridgeline and is much wider. Although longer and wider it's not a solid rock surface. This waterfall flows upwards of a week after heavy rainfall by means of the sponge effect. Trail data provided is for an out-n-back hike to the waterfalls. On the return, consider the short excursion up a small ramp style ridge, which I've dubbed the "Massacre Ramp". It's easy to spot heading back and away from the falls. There's nice 360-degree views from the top. There's also a sheer drop off. In fact, you're standing on an overhang if you're looking down. It kind of makes you take a step back when you look down, then notice there's no wall below. Note #1: The actual "Massacre Grounds" aren't along this trail. Request for more information will not receive response. From Mesa follow Highway 60 East to Idaho Road. Turn North onto Idaho Road which is SR88 and follow North 2.2 miles. SR88 bends right just past Scenic St. and Idaho continues North. Be sure to go right and stay on SR88. Follow SR88 5.2 miles to the signed turnoff for First Water Trailhead, this is FR-78. Turn right on to FR-78 and follow 0.6 miles to the large dirt parking lot which is the Crosscut Trailhead.